The musical duo Perrey and Kingsley (Jean-Jacques Perrey, b. 1929 and Gershon Kingsley, b. 1922) are pioneers in the field of electronic music. Before their collaboration, starting in 1965, electronic music was considered to be purely avant-garde. They were among the first to create electronic music for the general public. 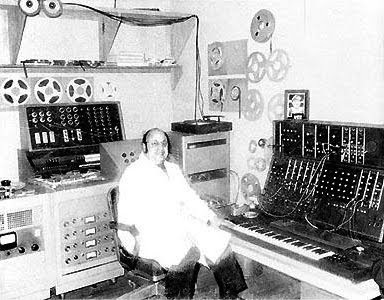 Jean-Jacques Perrey (born January 20,1929) is a French electronic music producer and was an early pioneer in the genre. He is best known within the sphere of popular music as a member of the influential electronic music duo Perrey and Kingsley, and for his unusually light-hearted style of music. The Happy Moog (1969) is my favorite.